The Enhancing Food Security in the Northeast (EFSNE) project started in 2011 to explore the potential for regional food systems to improve food security in the Northeastern U.S. Building on the nationwide interest in local food systems, EFSNE researchers have been motivated by a desire to understand whether regional food systems, which have a larger geographic scope, might have some of the perceived sustainability benefits attributed to local food while providing food accessible to all consumers. To this end, an interdisciplinary team drawn from academic institu­tions, federal government research organizations, and nonprofits has spent seven years trying to understand food consumption, distribution, pro­cessing, and production in the Northeast. 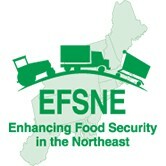 Through studying the actual supply chains in nine locations around the Northeast region and doing extensive modeling and analysis of secondary data on food systems, we have attempted to understand the extent to which the region can rely on its own food production and can meet the needs of low-income populations. This issue of JAFSCD presents an initial set of three papers that summarize key insights gathered so far. These papers explore (1) the food system as viewed through an eight-product market basket, (2) our experience engaging and informing stakeholders, and (3) consumers’ perceptions of regional food. Papers to be pub­lished in a later issue are likely to cover (4) our educational activities and their impact on students and trainees, (5) the distribution of products in the Northeast food system, and (6) the capacity of the region to produce food.